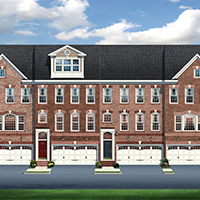 March 22–Tysons Corner, Virginia — The framing’s going up, the information trailer is on site and our new townhouses at Tysons Overlook, just off Route 7, are already selling. With four sold before construction started, we knew our address, three minutes East of Tysons Corner Center, would attract interest. It’s one of Fairfax County’s most sought after locations. But we think size and design have a lot to do with our early sales momentum. 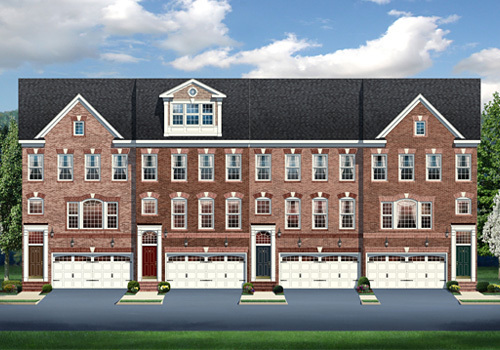 The classic brick-front exteriors of these three and four-level, two-car garage townhomes open into what are probably the area’s most spacious, 24′-wide interiors. And they include a number of custom-quality features and finishes, throughout – from high ceilings on the main and upper level and hardwood flooring in the family room to island kitchens with granite countertops and stainless steel appliances. In the four-level variation, you can have a full floor of privacy with a stunning owner’s suite, spa bath and separate sitting area on the third level and a two-bedroom loft a level up. It’s a great plan with flexibility built-in. If you’d like more information, call Phil at 703-927-7241 or visit CarrHomes.com.